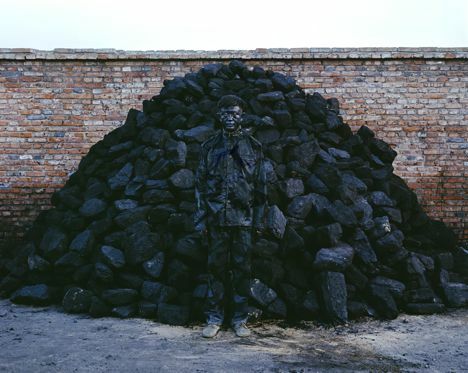 Liu Bolin is a Chinese performance artist. He performs around the world as well as China. Liu was born in 1973, Shandong, and graduated the China Central Academy of Fine Arts (Sculpture) in 2001. He uses himself as a canvas and blends into the background, still and quiet. His aim is to pass on how the environment is affecting the human life. When did you begin “Hiding in the City” series? I started this series when I was in an art village in Beijing. At that time, I wanted to create a place for about 40 artists from around the world – although this place was demolished at the end. The beginning of the series was made around this time, and I photographed these in the demolished studio. The body in the photograph was blended into the background but people were still there, standing. I believe this is a kind of ‘silent protest’. Why do you use ‘silent protest’ method? My creation process was quite long – I would stand 4 to 5 hours, and I completed all with the help of my assistants. I kept standing for all these hours and I never moved an inch. In fact, you can say that it is same as a ‘sit down strike’. It is a self-tormenting method. What do you think the ‘art’ should be? Be independent, and have your own thought which is separated from the power or system. What kind of artist do you like? While I was at university, I got to know a lot of artists, especially of modernism and postmodernism. I like Picasso and Andy Warhol. I think their art sets examples for many people.